Venom, directed by Ruben Fleischer (Zombieland, Gangster Squad), is the story of how investigative reporter Eddie Brock finds his life falling apart after a run-in with the "Life Foundation" and eventually becomes bonded with an alien life-form known as a symbiote. The symbiote, calling itself Venom, gives Eddie amazing powers but Venom is a dark force that seeks to kill for amusement and Eddie finds himself losing control of his own body and mind. Let's start with Tom Hardy, since I believe he is what a lot of people are saying is the best thing in Venom. To be fair, they are absolutely right. 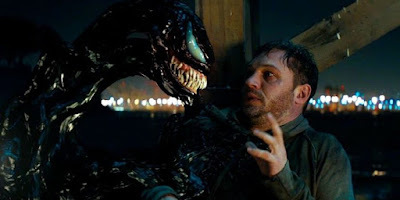 Tom Hardy is always a great actor, and he manages to eloquently portray the paranoia and spastic body movements that someone being overtaken by Venom should have. Surprisingly, I think Venom proves that Tom Hardy could actually be really funny and more films should take advantage of that. As Eddie Brock however... meh. While he has the name and investigative reporter job, his personality is not what comes to mind when you think of Eddie. In this, he's down and sad, which is fine, but there's a distinct lack of anger. And anger is one of Eddie's biggest selling points, at least during the early years of Venom. Tom Hardy's portrayal feels like a mixture of Peter Parker and Eddie Brock, but never quite reaching either of them. He's awkward, but not awkward enough to be Peter. And he's defeated, but not angry enough at his defeat to be Eddie. .....This is for the PS2, right? For all his faults in his performance, Topher Grace's Eddie was angry and vengeful, and that worked. I personally don't despise Topher Grace in Spider-Man 3 as much as most people do, but I don't think Tom Hardy has given us the correct portrayal of the great character either. To me, Topher Grace's version had the motivation to be Venom. Tom Hardy's does not. None of the other performances, such as Michelle Williams as love interest Anne Weying, Reid Scott as Anne's boyfriend Dan and Jenny Slate as scientist Dora Skirth, are really worth talking about. They do fine with what they are given, but the script is bland and the dialogue is everything you've heard about. The one exception is Riz Ahmed as Carlton Drake, the villain, and I think this might be the biggest miscasting of the year. He can be a good actor, but Riz Ahmed is not an intimidating man and seeing him try to square up to Tom "Bane" Hardy, give out speeches about the Bible that actually make no sense (his view on Isaac and Abraham is very distorted) and attempting to threaten people is almost cute. You think this scene is going to be awesome. You are mistaken. Speaking of distorted, the tone of this movie is one ugly stew of them. Sometimes, it wants to be a near-horror movie. At other times, it wants to be a dark comedy. At other times, it wants to be an explosive action. And then it wants to be... a rom-com. Yes, as weird as that sounds, Venom tries to act as Eddie's creepy adviser in love. It reminded me of Karen from Spider-Man Homecoming, but it makes even less sense than an A.I helping a teenager. And that brings us to Venom himself. 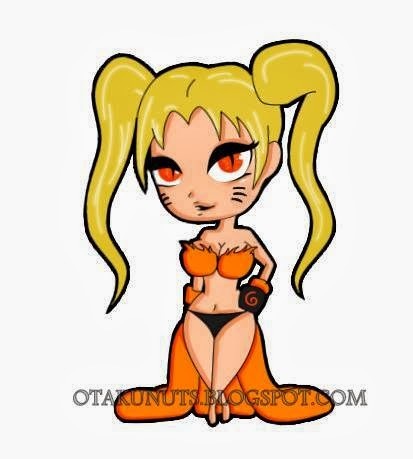 Oh, how I wish I could have liked this character. I really wanted to, but he's just not a well-written character. 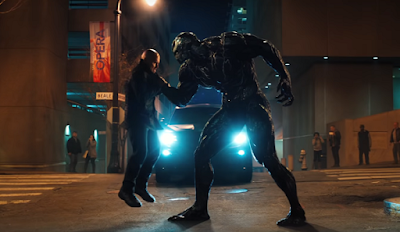 Venom is inconsistent, has no end goal, and has almost no connection to Eddie for the majority of the film besides a quip or two. When the film tries to deliver the "we've bonded and we're a team now" scene before the climax, it falls completely flat and doesn't fit with any of the past events whatsoever. The other symbiote that you've seen in the trailers, Riot, is basically the same as Venom but with less quips and seems to do nothing but wander around for 6 months until the climax is ready to let him join in. I admit to some satisfaction in seeing the character Venom be Venom. When he runs up a building, smashing everything as he does, it feels like Venom. The way he throws people around, bites off heads, threatens to chow down on a pancreas or two... It's what Venom should be. I was happy to see Venom, but I don't know if the movie deserves any praise for it since that's me just pleased at seeing a character in live-action again. Any film could have achieved that. It's obvious, but I'll say it anyway. This film is severely hurt by not having Spider-Man in it. Couldn't they have brought back Andrew Garfield? Or gone for Miles Morales? Or even Spider-Gwen? And maybe that other film could have made the CGI tolerable. It's amazing how far we've come with our special effects in cinema, but a movie with a $100 million budget can't make Venom's tongue look like an actual tongue. Not once does Venom seem like he's there, even when he's simply talking to Eddie in a reflection. Talk about embarrassing. The story is exactly what you expect, honestly. The first act is overly long and drags its feet to make sure you know how much of a loser Eddie is, (by the way, this act is far too reminiscent of 2004's Catwoman. And that is something no movie in 2018 should be compared to), before giving him the symbiote and becoming halfway-interesting, until it can lead to a big unearned climax where our hero fights a bigger version of themselves. A formula that we've seen over and over and over again, and we're meant to be moving past by now! 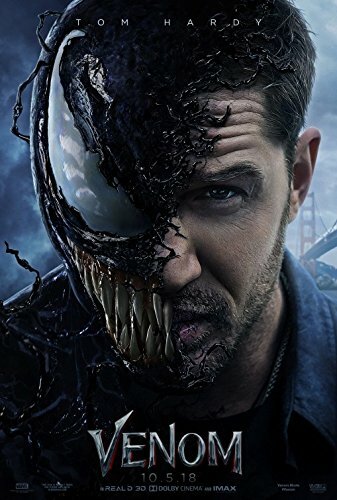 In a year where Teen Titans Go managed to get a movie, it's heartbreaking to see Venom be the worst comic book movie of 2018 (Unless Aquaman turns out to be offensively bad). A few decent quips from my favourite character in comics isn't enough to save this film, and if its a sign for things to come with this Spider-Man-Less Spider-Man Cinematic Universe, then we're all going to feel like Venom ate our delicious brains by the end of this decade. Best Performance: Tom Hardy as Eddie Brock/Venom. Best Part: Venom being Venom. Worst Part: No bond between the leads. sounds about right. not sure where people praise it to be better than it sounds since part of what makes venom work is the connection the symbiote and brock have to spiderman. there's various interpretations in various universe comics but spiderman is always the main focus at first where after that arc Venom comes and goes. sometimes on his own adventures and at times with spiderman. his current comics are without spiderman but again his origin links him to spiderman. yeah there's no real reason for Venom to already have his name. in the original comics it's something about being a venomous toxic when eddies was a reporter in how he tries to bring "truth" or something. in other retellings it's mostly to reference how he's a toxic venom for spiderman's life or anti-thesis depending on how you wanna interpret that. point being the symbiote by their very nature don't have names outside of being called the alien race known as klintar but that's not what this movie is focusing on since from what I could tell they were trying to mix the original comic and Ulitmate universe comic origins in this one since in ultimate spiderman Venom was created in the Life Foundation by Peter and Eddie's fathers as a cure for cancer. I think the last note to mention on this is creaking Cassidy and carnage. There is a lot wrong with that set up. 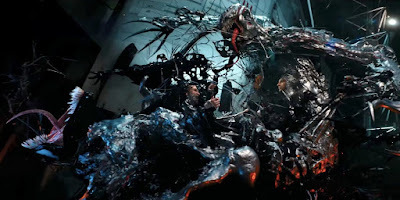 even if you take away Venom's other kids such as Riot who were made from him anyway when the life foundation captured him and caused him to have separation anxiety(yeah as in the sega and super nes game based on that comic arc lol) you can't change the fact the carnage symbiote was born from Venom and just suddenly drop him as another character that's been around and Carnage is a literal venom 2.0. not in a bad way like most can say Boruto is a Naruto 2.0 I mean that's Carnage's main thing. to be better and stronger than venom in every aspect. I think I'm done since I know this is old and should move on to what else is new. The strange thing is, even though they should have Spiderman, there was a way to do this without him. Now, that would require some genius writers who would be able to utilise Carlton Drake or some other character (Like Miles Morales perhaps) in an appropriate manner... but trust me, those writers are busy doing better films. Like Aquaman probably. Same thing with his name. He just introduces himself as Venom. It's weird. They could have created any reason for him to call himself that, like Eddie hating what he's forced to write at one point or something, but the symbiote just says "My name is Venom" and that's the end of the discussion. As for Cassidy... I think its too early to really say what the story is there. For all we know, Venom 2 could have Venom literally be split in half or something and one half goes to Cassidy, creating Venom. At the moment, he's just Woody Harrelson in a Carrot Top wig saying the word "Carnage". Plenty of possibilities for him in the sequel. yeah but I really can't see venom without his trademark spider on him. in ultimate spiderman it made sense why he was missing it since peter still had some of venom in him and got it at the end.